A few weeks ago, my husband and I painted one of our dining room walls with chalkboard paint. 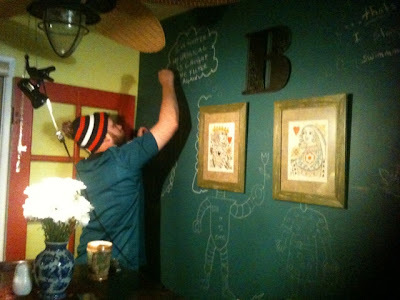 It was an excuse to add (yet another) color to our walls, and to have more opportunities to doodle and write on the fly. I'm surprised that it's taken a while to work up the nerve to draw on the wall. Visitors have done so more than we have. An friend of ours is visiting from L.A. tonight. He and my husband are old friends from acting school. They both share a love for Harley Davidson motorcycles and making people laugh. My cheeks hurt from spending the evening with the two of them and hearing their stories. Our friend was telling us about a party game he played recently that included a large set of cards with random funny (and potentially offensive and inappropriate) questions and answers. I did a little research and I think this is the game he was referring too. In the spirit of the evening, I had the idea to adapt the game to work with our chalkboard wall. We made good use of the two speech bubbles I had originally scrawled on the the wall shortly after the paint had dried. My husband claims naming rights to the game, "I Know What You're Thinking." The rules are simple: we take turns filling in one speech bubble in response to the other. Line crossing is encouraged. Game play opens to any and all visitors to the house and continues indefinitely. Tonight, the game began with the second bubble stating, "...and that's why I stopped my swimming lessons." That left us wiiiiide open. That's my husband detailing how he got something or other (ahem) "stuck in the pool filter again." As you can imagine, the sole purpose is to use shock value to make each other laugh. We are well passed the point of offending each other and the history we have provides quite the bank of memorable one-liners and inside jokes. What a wonderfully fun idea! I would love to have a giant drawing wall in my studio! Guess what you just contributed to the latest addition to my possibilities file!